Anyway, on to today's post. 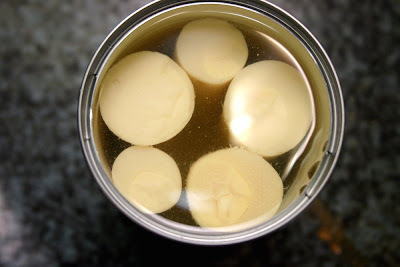 I am so excited to be posting about a Mad Men recipe. 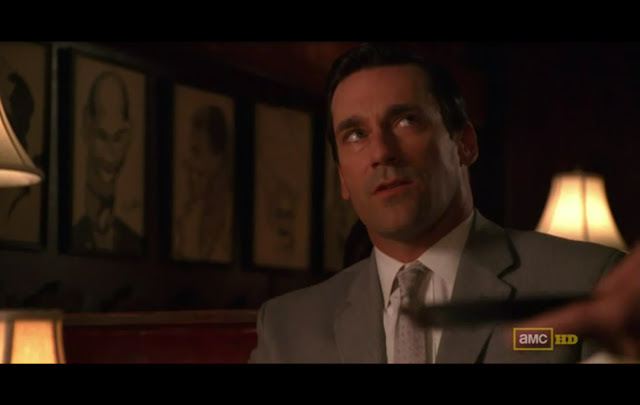 I am a huge Mad Men fan and having my beloved show back for Season 5 just feels sensational. Although I don't have the premium channel package from my service provider, I was able to watch it on Amazon with a season TV pass. You can check out Amazon's Mad Men Season 5 instant video channel here. Last night's two-hour season premiere is not to be missed! Sardi's Hearts of Palm Salad was a dish ordered by Don Draper in Season 2, episode 5 called A Little Kiss. He was called to Sardi's (a real life restaurant in the heart of New York's theater district) by the seductive Bobbi Barrett, one of several women whom he's sleeping with that season. Bobbi is a strong minded woman who's into business just like one of the boys. She asks Don to order for her and he picks exactly what she wants -- steak tartare. A brilliant food metaphor, no? 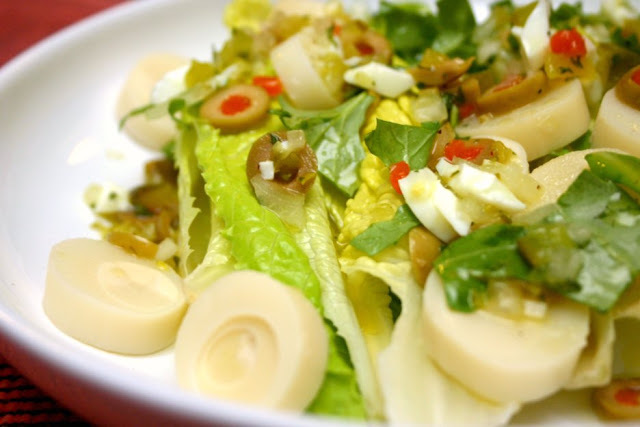 For himself, he orders the Hearts of Palm salad. "Hearts of palm salad.....steak tartare." I've never had hearts of palm before so I was curious to try it. When I saw the recipe floating around online and that it is an excerpt from the new Mad Men cookbook, I thought it would be a perfect time to try it; a personal welcome to Season 5. Original recipe shown below taken from foodchannel.com. I subbed a few ingredients due to preference so they're noted below too. This salad serves 2. 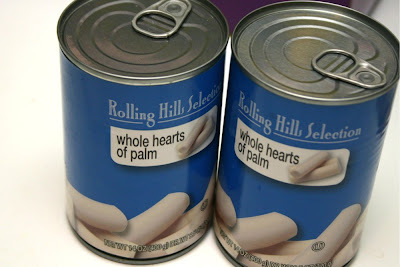 Canned hearts of palm which I had picked up from Fresh and Easy. You get about 5 or 6 in a can. Drain and slice into 1/2 inch rounds. Place lettuce flat on dish. 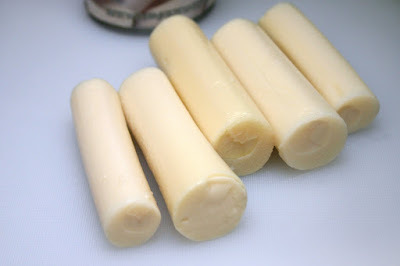 Arrange hearts of palm in a row. Ar­range pimiento slices across lettuce and decorate at side with watercress. Serve with Vinaigrette Dressing. Place the finely chopped ingredients in a small bowl. Sprinkle with salt and add olive oil. Stir thoroughly while adding vin­egar. Keep in refrigerator. Always stir before using. 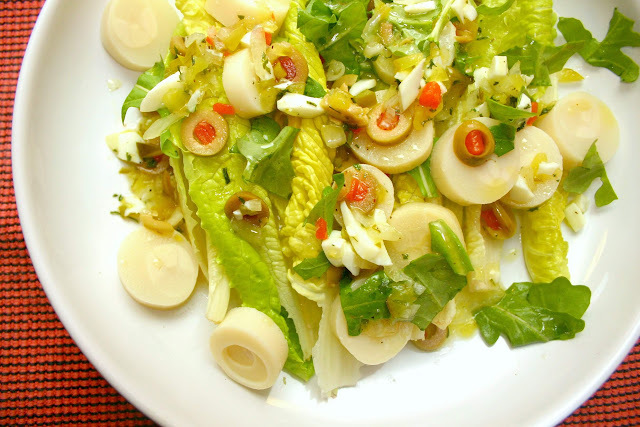 Sardi's Hearts of Palm Salad - up close.